Today’s first took place during the kick off of Downtown Joplin’s wildly popular event, Third Thursday. Held each year, from March until October, on the third Thursday of the month (hence the name), this event is located from 7th Street to A Street on Main Street. Roads are blocked off, stores and restaurants stay open late and vendors, performers, musicians and artists line the streets and inhabit storefronts for the evening. Thousands of people stroll up and down Main and spill over onto neighboring avenues, viewing art, listening to a variety of music and catching up with friends. The first day of spring was perfect, weather wise, and people turned out in huge numbers for the first Third Thursday of the year. Greg, sister Linda and I were some of those people! I’ve attended many Third Thursdays so that couldn’t be my first today. Therefore, I made a point of visiting a couple of businesses that I’ve not been to before. Blue Moon Market, located at 613 S Main, features clothing, jewelry, accessories and distinctive home furnishings. My sister and I LOVED this store. I believe they have been open for a little while, but I had not made it by yet. What a lovely and eclectic mix of product. Linda and I just missed the hippie era, but we love the look of smocked oversized tops and loose comfy pants. Perfect yoga clothes are available here! Vintage items and jewelry caught our eyes as did painted signs and banners. There were even old doors for sale at the back of the shop. They truly do have a little bit of everything here. The store was very crowded with ladies ooohing and aaaahing over the merchandise so we intend to visit again very soon and shop. 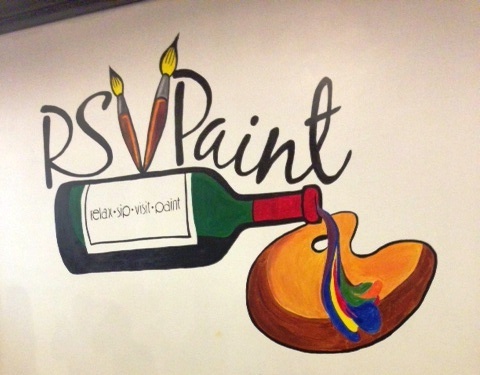 The second business I visited during Third Thursday was RSVPaint, located at 420 S Main. Tonight was the Open House for this new venture in Joplin. Originating from Springfield, MO, where they have been very successful, RSVPaint offers a place to relax, sip, visit and paint. Classes are offered Thursday – Saturday in the evenings. In two hours, you can create a work of art to take home. It was fun to look at the sample pieces and classes offered. We passed this evening on the wine, that’s the sip part, but we did sign up for a class next week! It will be a great experience that we can share, and of course, a first for me. What a great evening of strolling, looking, chatting with friends and listening to music. To my surprise and delight, there was even a young man, splendid looking in his kilt, playing the bagpipes. Now that’s not something you hear and see every day in Joplin! I’m glad I caught his performance. I look forward to the next Third Thursday, and the new adventures awaiting me there.